Demand for housing in San Francisco is so high, people apparently are willing to live in apartment as small as 220-square feet. How small is 220-square feet? We're talking tiny. It's about the size of nine pool tables. An apartment complex in the City called Cubix SF is hoping to make the tiny units home to hundreds of residents. First the city building code has to be changes. Right now newly constructed dwellings have to be at least 290 square feet. And that's bigger than Cubix will offer. Developer Patrick Kennedy told the Los Angeles Times he will unveil a building with micro units South of Market later this year. Pricing will be somewhere between $200,000 and $250,000. For that you get a sofa bed, two burner stove top, mini-fridge, and a wardrobe. In New York, city leaders have capped the number of these kind of "micro units" at 60. Vanguard Properties told the Los Angeles Times he's hoping for no cap. San Francisco is home to a unique new condo development in the South of Market neighborhood. Cubix Yerba Buena consists of 98 condos with a starting price of $200,00 which is only 1/3 of the current median home price. The small but well designed living spaces range in size from 250 - 350 square feet. Cubix reflects modern architecture design ideas most often found in cities like Tokyo, Hong Kong and Amsterdam. 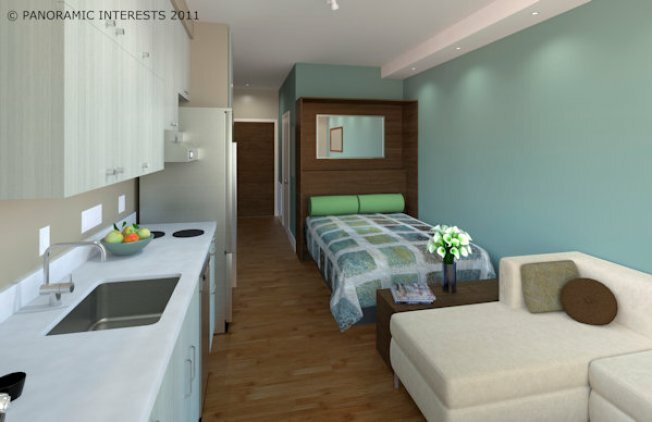 Small and functional urban living spaces targeted to middle income buyers. Cubix Yerba Buena was designed and built by, HausBau, a San Francisco design and development company founded by architect George Hauser.